I was not instantly in love when I was learning how to snowboard. In fact, I was so bad, that I used to ride down the mountain backwards because I didn’t know the proper mechanics of the sport! David started off skiing when he was young and quickly took on learning how to snowboard. The Right Gear Makes a Difference When Learning How to Snowboard! Base and Mid Layers: These layers are to be worn underneath your jacket and pants and helps to keep you warm on those particularly cold days. Try to avoid any cotton products since they are not breathable or waterproof. Instead, look for synthetic or wool fabrics since they’ll keep out moisture and maintain your body temperature. We both prefer Under Armour Base Layers due to their quality. Helmet: We get it helmets – helmets may look a little dorky. But, don’t be caught on the mountain without one, ESPECIALLY as a beginner! To this day, I STILL wear helmets to be safe. I like my skull in tact! Gloves: These are tricky. I’ve always struggled with finding which ones work best for me. Personally, I prefer mittens since my hands are ALWAYS cold. Mittens help keep my hands a lot warmer. If you’re like me, consider also getting leather since it doesn’t rip easily and keeps your hands nice and warm. If you’re still struggling with warmth, there are hand and foot heaters that you can easily grab at a local shop! We both actually have the same exact pair of CandyGrind Mittens that are pretty affordable and made out of quality leather. 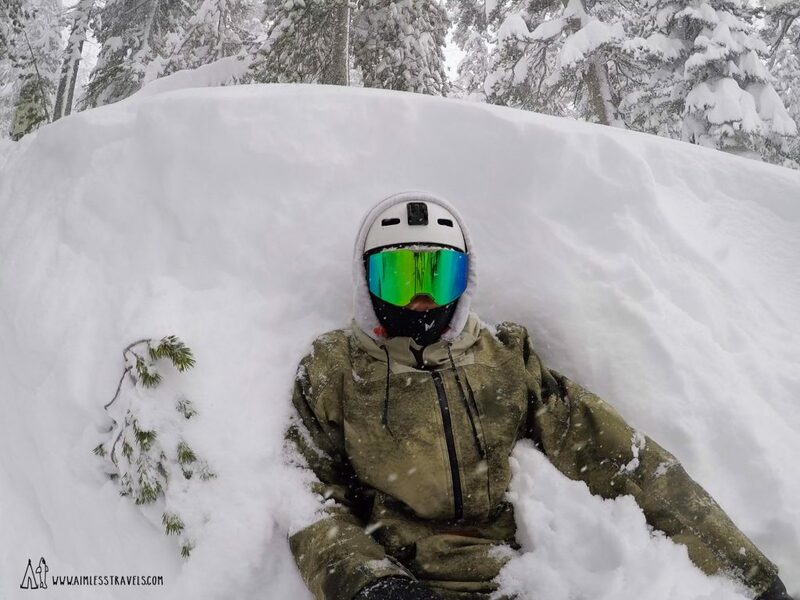 Goggles: There are a ton of different types of goggles to choose from for snowboarding depending on the different types of conditions you’d be riding in including white out conditions, sunny days, low light, etc. Our absolute favorite goggles that we recently purchased WERE the Oakley Flight Deck XM Prizm Sapphire goggles. They have worked so great in all types of conditions that we’ve encountered! Snowboard Boots: These can be something that you can usually rent when getting your snowboard. If you plan on committing to a long-term relationship with snowboarding, we’d recommend getting your own pair of boots. When buying boots, you have the opportunity to heat mold them to conform to your feet. This gives you a lot more flexibility and comfort while riding! Which Snowboard Is Right For You & Leads to Less Bruises? Getting to understand which board you like to ride best is going to take time and patience. Chances are, you aren’t going to be the next Shaun White when you hop on the board your first time. Don’t jump the gun and find the first board that speaks to you, or has a pretty design, at your local snowboarding shop. We’d recommend renting first. The different types of snowboards include Freestyle, All Mountain, Alpine, Camber, Rocker, and Hybrids. As a beginner, you’re probably going to prefer going with a Freestyle snowboard since they are easier to control and often shorter. If you plan on renting, they’ll also give you a pair of bindings with your snowboard. Bindings are another thing that we wouldn’t recommend buying as a beginner since it takes you some time to understand exactly what works for you. What Should You Expect in Terms of Weather? You should always check what the weather is going to be before you go on your trip. But, that’s a given. Each region across the United States and around the world is different in terms of the conditions you’ll expect. As a general rule of thumb, east coast riding is usually accompanied by a lot of ice and not that much pow (just a fancy snowboarding term for powder, or fresh snow). Furthermore, since the region doesn’t experience as much snow, a lot of resorts use snow machines to make artificial snow. West coast riding will have a lot more fresh pow and generally less ice, assuming you’re not in a super “wet” area. What Are the Best Conditions When Learning How to Snowboard & What Else Should I Know? 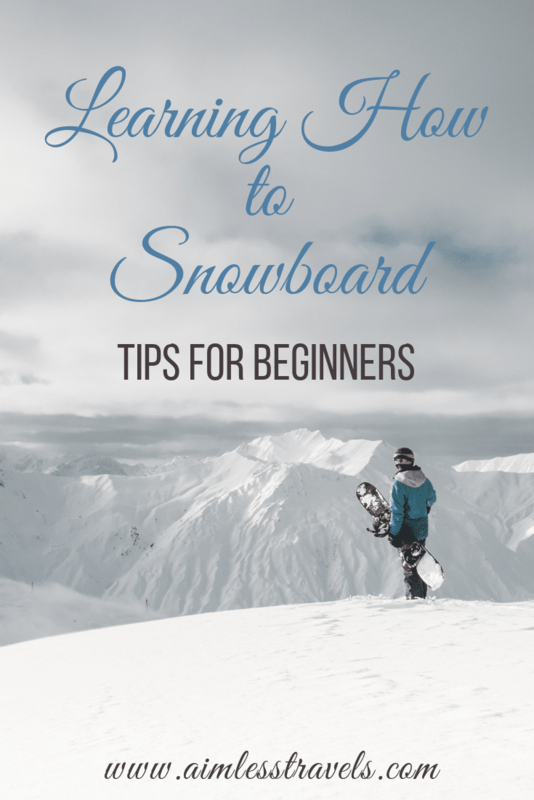 Mostly all ski resorts offer beginner snowboarding lessons. We’re really recommend taking a one-on-one lessons. Group lessons are great, but they don’t give you as much individual attention that you really need when starting off. I have taken both group and individual and definitely learned SO much more during my private lesson. -Are You a Goofy or Regular Rider? Image you’re about to slide across your kitchen floor with socks. Which foot do you put in front? Is it your bad or good leg? If it’s your good leg, your stance on a snowboard would be labeled as Goofy. If it’s your bad leg, you’ll have a regular stance. Ever see those people having some scary crashes on ski lifts? It happens, I’m still not that great with getting off a ski lift! But, some deadly incidents could be avoided by learned how to properly skate on your snowboard and ride with only one boot strapped it. This is a pretty simple lesson that you could just practice a few times prior to getting onto your first lift. Learning edge control is another fancy term for learning how to control and turn your board. Figuring this out will hopefully avoid you running into poor little Jimmy on the skis. We’ve all been there…I’ve definitely had a few beginners on both skis and snowboards take a nice crash into me. But, learning control and how to stop and dig your edge into the snow early on will save you that embarrassment and frustration! When beginning, it’s so tempting to look at the ground when learning how to snowboard. It’s an intimidating sport and all you’re really thinking about doing is falling. Try to avoid this! Keep your head up and look where you want to go. Pick out your line and follow it. Doing this will allow you to avoid collisions with other skiers, riders, or a tree. Even as experienced snowboarders, ice catches us off guard. It’s incredibly easy to lose your edge on ice and fall. Falling on ice will definitely lead to some gnarly bruises, so just avoid it! A lot of powder is something a beginner should also avoid. Riding in 1-2 feet of snow is a lot different than riding groomed trails. It’s easy to get stuck in deep snow and takes a lot of practice. 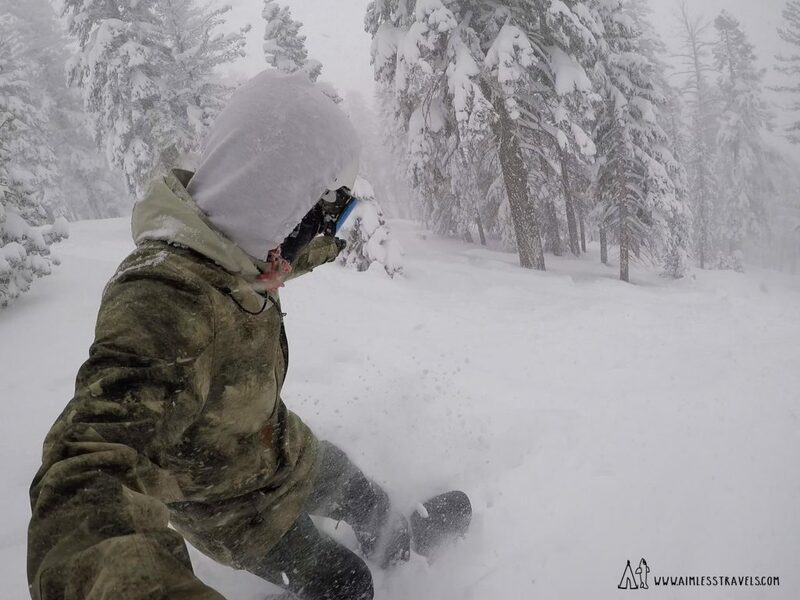 Recently, during our trip to Lake Tahoe, California, we had about 4 feet of snow and it was almost like I was learning how to snowboard again! Most Importantly: Have Fun When Learning How to Snowboard! Learning how to snowboard can definitely be a bit frustrating, especially when if you don’t pick it up as quickly as me. Snowboarding is supposed to be fun and you need to take your time and be patient in order to learn. Figure out how to do the basics first and then get into the more technical aspects. Trust me, you will get there! Seriously…it took me a couple of years before it suddenly clicked for me and now you can’t get me off the mountain! Learn to understand your board and body and I promise you’ll love snowboarding as much as we do!